The Amano MJR-7000EZ is an introduction to the MJR-series time totalizer calculating time clocks for companies that require a time totalizer that can handle up to three different parameterization shift rule sets. 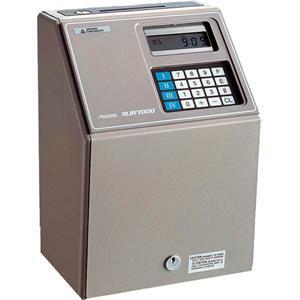 Like the MJR-7000 this clock is a reliable time clock that does the calculations for you, however up to three different shift rule set can be configured. Employees are assigned to a shift rule set through the distribution of numbered time cards and the defined overtime, rounding, meal/break deductions, etc are applied according to all the assigned employees. The MJR-7000EZ accommodates up to 100 employees and has features and a track record of reliability no other time totalizing time recorder can match. The clock uses the special numeric timecards with a series of 0 to 99 to track the hours (can be programmed to use other numbers, but only up to 100 in sequence). Programmable automatic break/meal deduction and revision zones.